Imagine sitting across from Saddam Hussein every day for nearly seven straight months—slowly earning his trust, getting him to spill secrets on everything from whether he gave the order to gas the Kurds (he did) to whether he really did have weapons of mass destruction on the eve of war (he didn’t). All the while gathering information that would ultimately be used to prosecute the deposed dictator in an Iraqi court. That was the job of FBI Special Agent George Piro, who told his story Sunday, January 27, on the TV news program 60 Minutes. Soon after U.S. Special Forces pulled Saddam out of a spider hole on December 13, 2003, the CIA—knowing the former dictator would ultimately have to answer for his crimes against the Iraqi people—asked the FBI to debrief Hussein because of our longstanding work in gathering statements for court. That’s when we turned to Piro, an investigator on our terrorism fly team who was born in Beirut and speaks Arabic fluently. Piro was supported by a team of CIA analysts and FBI agents, intelligence analysts, language specialists, and a behavioral profiler. Piro knew getting Saddam to talk wouldn’t be easy. He prepped by carefully studying the former dictator’s life so he could better connect with Saddam and more easily determine when he was being honest. It worked: during the first interview on January 13, 2004, Piro talked about Saddam’s four novels and Iraqi history, which impressed Hussein. Saddam asked for Piro to come back. From that day forward, everything Piro did was designed to build an emotional bond with Saddam and to get him to talk truthfully. To make Hussein dependent on him and him alone, Piro became responsible for virtually every aspect of his life, including his personal needs. He always treated Saddam with respect, knowing he would not respond to threats or tough tactics. As part of his plan, Piro also never told Hussein that he was an FBI field agent, instead letting him believe, for the sake of building credibility, that he was a high-level official who reported directly to the President. It took time. Piro spent five to seven hours a day with Saddam for months, taking advantage of every small opportunity that presented itself, including listening to Hussein’s poetry. Eventually, Saddam began to open up. * Saddam misled the world into believing that he had weapons of mass destruction in the months leading up to the war because he feared another invasion by Iran, but he did fully intend to rebuild his WMD program. * Piro told 60 Minutes that Saddam considered Usama bin Laden “a fanatic” and a threat who couldn’t be trusted. * The former dictator admitted “initially miscalculating President Bush and President Bush’s intentions,” Piro said, thinking the war would be more like the shortened air campaign of the Gulf War. * Saddam never used look-alikes or body doubles as widely believed, thinking no one could really play his part. * Hussein made the decision to invade neighboring Kuwait in 1990 following an insulting comment by one of its emirs. Piro was so successful at befriending Saddam that the former dictator was visibly moved when they said goodbye. “I saw him tear up,” Piro said during the television interview. To watch or read the full interview of George Piro, visit the 60 Minutes website HERE. Saddam's Link with Terrorists - Who's Spinning Intel? Iraqi How-to Manual made for Arab Military Operatives in Afghanistan!!!? Here’s another FOX News exclusive revealing an Iraqi manual made for Arab military operating in Afghanistan. This Translation /Analysis is titled “Iraq How-to Manual Directed Arab Military Operatives in Afghanistan” and was by Ray Robison. The 500 munitions discovered throughout Iraq since 2003 and discussed in a National Ground Intelligence Center report meet the criteria of weapons of mass destruction, the center's commander said here today. 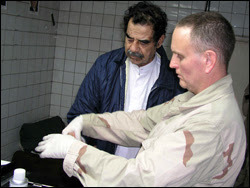 With a small cadre of independent translators to support his efforts, Ray Robison, currently a military operations research analyst specializing in aviation and missile research in Huntsville, Ala will translate and analyze scores of the unexplored trove of documents from Saddam's regime in a FOXNews.com exclusive series: The Saddam Dossier.